TimeTrak is an effective resource and time management tool which enables businesses in the trade and service industries to allow their field staff to essentially log in and out of a work day. This provides Service Coordinators with the ability to track when remote staff start and finish their work days without them punching in a card at the office. Mobile users will still check in to jobs to save time and disbursements against jobs they worked on during the day as usual but with the Clock On feature, the rest of their time can automatically populate when they clock out for the day. Our field service management software is a simple to use platform, that enables your technicians to complete all time recording requirements while out in the field - reducing paper and increasing billable hours. TimeTrak allows your staff, both in the office and out in the field, to keep track of time spent on jobs or over a whole day. Clocking on and off for the day allows your field technicians to record the full number of hours worked with a simple click of the button. 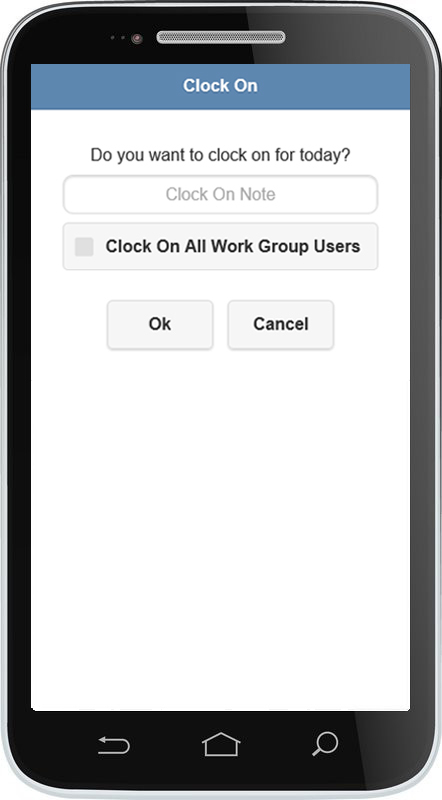 While techs are still able to enter their time and materials against individual jobs, the clock on clock off feature automatically fills in the time around logged jobs, reducing the time your team have to spend entering non-productive time into their calendars. Clocking on and off for workgroups works in the same way as it does for individuals, except Team Leaders are able to clock their entire workgroup on and off for the day rather than each worker entering the same time. Learn more about group scheduling and time recording here. Using TimeTrak, teams are able to enter their time via the online application, reducing paperwork, double entry of data and increasing billable hours due to technicians not having to return to the office between jobs and at the start and end of the day. It also helps to dramatically reduce time consuming administrative tasks.